EachÂ handmade Murano glass lentil bead measures 18mm. 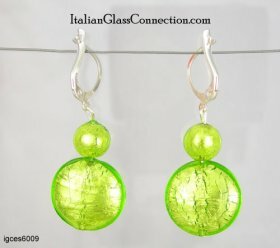 EachÂ handmade Murano glassÂ round bead measures 8mm. The leverback earring fittings areÂ 925 sterling silver. Bead colors: Herb Green on Silver Leaf.